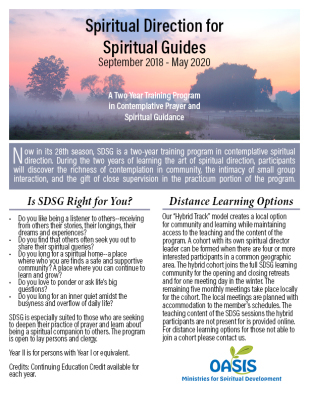 Now in its 28th season, SDSG is a two-year training program in contemplative spiritual direction. 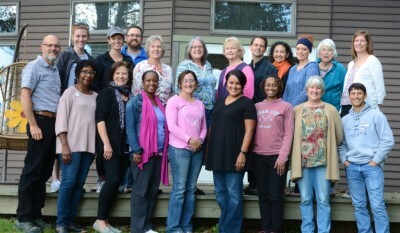 During the two years of learning the art of spiritual direction, participants will discover the richness of contemplation in community, the intimacy of small group interaction, and the gift of close supervision in the practicum portion of the program. group experiences. Central to our process in both years are peer groups of 4-6 people who spend time each month in spiritual support of one another and in reflecting together on their practice of spiritual direction. Each peer group is facilitated by a trained spiritual director. 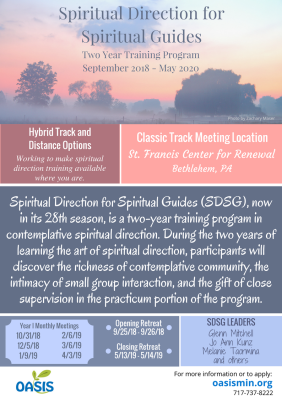 Participants are asked to have a spiritual director while in the program and, by December 2018, begin meeting with two individuals as a spiritual guide in training. the art of spiritual direction. and expanded peer group time to strengthen the practice of spiritual direction. present for is provided online. For distance learning options for those not able to join a cohort please contact us. Is SDSG right for you? Do you like being a listener to others--receiving from others their stories, their longings, their dreams and experiences? Do you find that others often seek you out to share their spiritual queries? Do you long for a spiritual home--a place where who you are finds a safe and supportive community? A place where you can continue to learn and grow? Do you love to ponder or ask life's big questions? Year II is for persons with Year I or equivalent. Credits: Continuing Education Credit available for each year. TUITION: $2,695 per year, plus an Application Fee of $200* first year (non-refundable, not part of tuition). *Please Note: If you are a Princeton Student, the application fee is waived. If the application is received by May 31, 2018, the participant will receive a discount of $100 from their tuition. If the application is received after August 31, 2018, $75 will be added to their tuition fee. Payments by check or credit card (MasterCard, Visa and Discover) are welcome. If paying via installments we anticipate the first payment to be $350 (plus $75 if application was received after August 31, 2018, minus $100 if application was received prior to May 31, 2018). The first payment is due upon acceptance into the program (by September) and payments of $335 monthly October- April. SDSG I and II participants are asked to complete a Payment Agreement Form. This form is included in the Acceptance Letter received by SDSG I participants. For SDSG II participants, please click here to open this form that can be completed online or printed and mailed to the office. The form will open in a new window. Please download the form first, then fill in your information, save it again and then attach as a document in an email to the office. ​If withdrawing prior to September 1, a full refund of tuition already paid will be returned, less $50 to cover administrative time and processing. attended. Oasis rarely cancels due to weather. If a regular program is cancelled due to weather an online meeting may be possible and any missed content will be made available to participants. No refunds for snow days or for sessions a participant needs to miss. Jo Ann Kunz (SDSG DYDM), M.A., serves as a Senior Pastor at a non-denominational Christian church located in Lititz, PA. She teaches spiritual formation/spiritual direction at both Eastern University and Evangelical Theological Seminary, as well as being a certified Enneagram trainer. 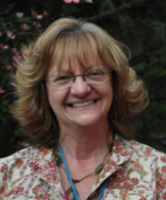 Jo Ann has been part of the faculty of Oasis Ministries since 2001. She serves as a retreat and workshop facilitator, maintains a private spiritual direction practice, and holds a special interest in dream work. Melanie Taormina (SDSG) is a graduate of Oasis Ministries’ Spiritual Direction for Spiritual Guides program and has a spiritual direction practice in Williamsport, Pa. She has led contemplative Bible studies and workshops and retreats on prayer and spirituality. She finds inspiration and expression in poetry, photography, and Taize prayer, and has discovered in the joys and demands of parenthood a crucible for the practice of presence. 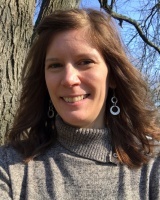 Melanie lives with her husband and young son in Williamsport, where she is active in her church and in the Lycoming College community. Ruth Workman (SDSG DYDM), EdM, MA, is a Certified Spiritual Director, Retreat Leader, and Certified Supervisor of Spiritual Directors. She has offered Spiritual Direction since 1995. Ruth Is a teacher in the Deepening Year in Direction Ministries and a peer group leader for Spiritual Direction for Spiritual Guides years 1 and 2 through Oasis Ministries for Spiritual Formation. She is an Adjunct Professor at Princeton Theological Seminary where she teaches Spiritual Direction and offers individual and group Spiritual Direction to students and faculty. Ruth leads Ignatian and contemplative retreats at The Sanctuary, her home in Stone Harbor, NJ. Betty Wright- Riggins, (SDSG) is an ordained American Baptist minister. She holds a BA, MA and MDiv. She is a spiritual director, retreat leader, church transitions and spiritual formation consultant. She is a certified Grief and Recovery Method Specialist. Betty has served her community as pastor, adjunct professor teaching courses in prayer, spiritual formation and grief and loss. She has been a principal, speech pathologist, and financial services consultant for pastors. 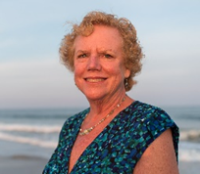 Betty currently convenes a spiritual formation group in her home and is a member of the spiritual directors network serving students at Princeton Theological Seminary.